Here's a sun-lovin' room for you to get some extra relaxation. The sliding tempered glass panels in aluminum frames glide from fully closed to any desired opening...you get just the breeze you want. Each sliding glass wall panel has its own sliding screen with handle locking latch. 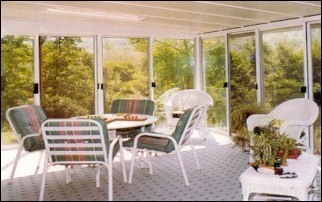 The Patio Room features large, sliding glass wall panels...giving you maximum light, ventilation and full-view. It's just like being outdoors! 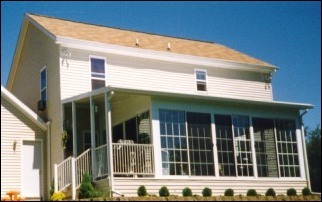 Window Wall panels are available with grids or clear-view insulated glass. Each All-Season Room is custom designed for your home. Many other sizes and options available. Call 1-888-277-7220 for a price quote. Installation not included and will be the responsibility of the buyer.